HDL Creator™ - Blue Pearl Software Inc. The Blue Pearl Software, HDL Creator is ideal for developers coding both RTL and test benches who are seeking productivity, predictability and code quality for complex FPGAs, ASICs, and IP Designs. 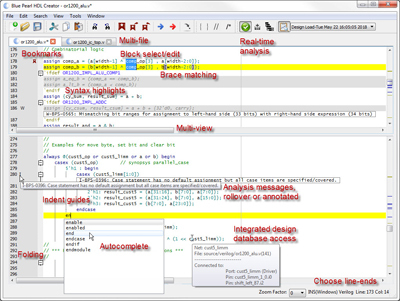 HDL Creator provides real-time syntax and style code checking inside an intuitive, easy-to-use full featured editor. 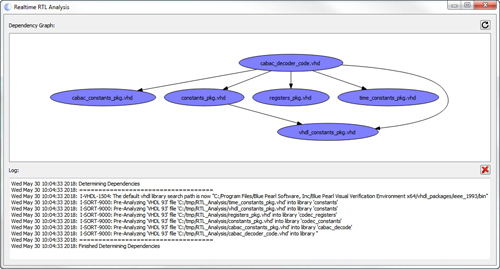 Unlike standard editors, HDL Creator provides advanced real-time file analysis to find and fix complex issues as you code, such as compilation dependencies and missing dependencies. In addition, HDL Creator provides advanced design views to help understand and debug as you code. The HDL Creator is a full-featured source code editor that provides real-time syntax and style checking during HDL code development. In addition to all the normal features you would expect from a code editor, HDL Creator provides over 2000 real time checks to streamline code development and avoid common coding mistakes that would result in downstream design iterations. Over 2000 Verilog and VHDL parsing analysis messages. HDL Creator is not just an ordinary editor, as a smart editor it also provides real-time views that help you understand and verify issues as you code. 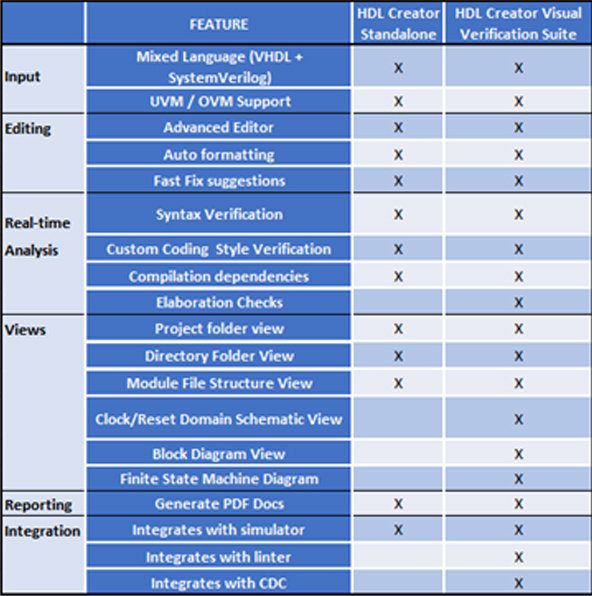 HDL Creator is provided as both a stand-alone HDL editor tool as well as integrated into Blue Pearl’s Visual Verification suite. As a standalone editor, HDL Creator is ideal for design teams that work closely with Verification teams, avoiding unnecessary design iteration between teams by catching common coding and style issues up front as you code! When used inside the Visual Verification Suite, additional analysis, views and integration are available that extend the HDL Creators capabilities streamlining HDL development.